1 cup raw almonds, walnuts, sunflower, pumpkin seeds, or a mix of them. I’m big on nuts and seeds. They are satisfying and keep our blood sugar nice and balanced providing steady fuel, compared to the fast burning empty energy of the snacks so many of us habitually turn to. They’re so easy and healthy – giving you a great boost of zinc and healthy fats. In fact, studies looking at the health benefits of a healthy diet on heart disease prevention have found that one of the most important ‘ingredients’ is nuts! Nuts and seeds are also easy to find in many stores, even in a pinch you can find them at airports and convenience stores – albeit not always top quality. I keep my pantry well-stocked with jars of a variety of nuts including almonds, cashews, pecans, and walnuts, as well as pumpkin and sunflower seeds. To up the yummy snack factor, and make sure you’re getting the healthiest options, make your own roasted and seasoned nuts and seeds (or just seeds if you’re allergic to tree nuts!). Keep them in mini-mason jars which are practically indestructible and can be toted in your handbag, or use small BPA-free storage containers so you never leave home without a snack stash – meaning you’ll never have to grab for a junk-food snack again. A serving size is about a handful, and that’s about the daily amount also recommended for heart health – including keeping your cholesterol in a good range. I love to dry roast and season them with herbs and spices – which make them not only even more delicious but add their own metabolism and immune healthy boosting benefits. 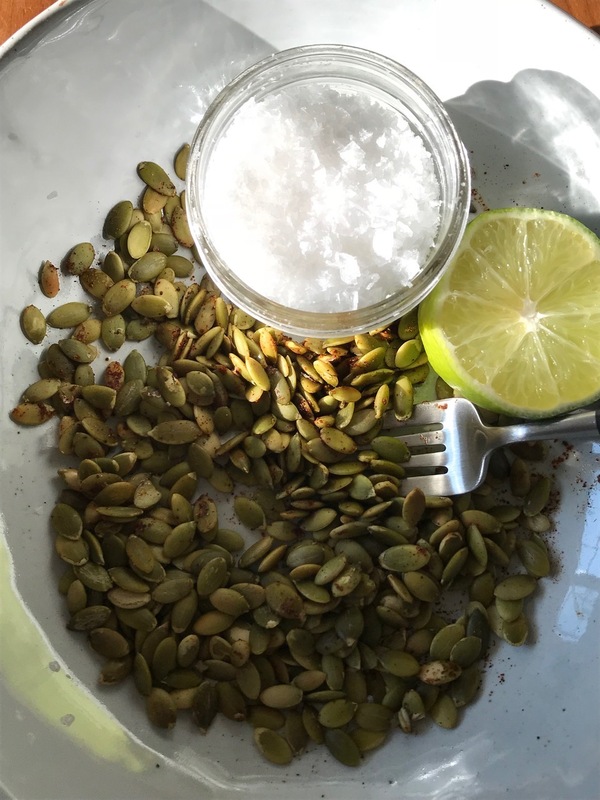 Lime chili pepitas (pumpkin seeds) are my recent snack obsession. Here’s how to make your own – in about 10 minute max, start to finish. Make enough to last for a week at a time. Toss on any seasonings you like. Place nuts or seeds in a thin layer in a cast iron skillet, over low heat. Stir often, while slowly roasting seeds for about 2 minutes, nuts for slightly longer. Allow to get lightly brownish without burning. Turn off heat, toss in any of your seasoning choices. Cool to room temperature and then store in a glass jar or container. Toast 1/4 cup of raw organic pumpkin seeds in a cast iron or stainless steel skillet until they start to making little popping sounds. Turn off the heat and squeeze the juice of 1/4 lime, and sprinkle a wee bit of Himalayan or Maldon salt on them and dash a bit of chill powder on top. Can’t eat chilis? No worries – the lime salt version is still amazing or try some garlic powder!